"Because we're in a detective story, and we don't fool the reader by pretending we're not." T.H. White carved himself a legacy in English literature with The Once and Future King (1958), a composition of older and some new work forming an epic Arthurian fantasy, but like so many of White’s contemporaries, he was an avid mystery reader in his earlier years – and wound up with an excellent, but mostly unacknowledged, detective novel to his name. In many ways, White’s Darkness at Pemberley (1932) echoes the one-offs from other literary/academic visitors such as Morris Bishop (The Widening Stain, 1942) and A.A. Milne (The Red House Mystery, 1922). They're intelligently written stories filled with literate characters, but they're also witty and a lighthearted touch makes them fun to read. 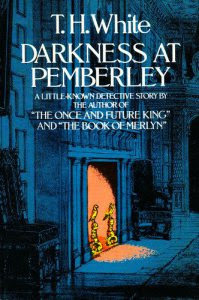 Where White distinct himself from his colleagues, however, is that Darkness at Pemberley emphatically proved itself to be a superior example from this sub-category and the structure of the plot was (for me anyway) an interesting composite of two eras – turn of the 20th century mystery fiction and Golden Age Detectives. The first part of the book, roughly 90-pages in the Dover edition, is a classic Golden Age mystery and has everything you want from that period, from a multitude of maps and floor plans to a genuine locked room problem. Yay! St. Bernard's College is the setting for the first act and opens when Mr. Beedon, a history don, fails to meet his colleague, Mauleverrer, and a student for an appointment, but when their knocks is answered with music from a gramophone being turned on, they take their leave – only to hear the next morning that Beedon has died. The history don was found locked inside his room, dead of an apparent self-inflicted gunshot wound to the head, with a gun lying at his feet that's quickly tied to the shooting of an undergraduate earlier that evening. A close and shut case of murder/suicide, or so it appears, but chance, forensics and Inspector Buller's determination throws a monkey-wrench in the carefully planned plot of the killer. It's a knotty little affair involving a crafty alibi, invisible ink, cocaine addiction and a twist on an old trick to create the effect of the locked room. The trick itself shows that White has read impossible crime stories from a different era, they're crude in principle, but White found another way to apply one of them and the overall result was pleasing. Before the halfway mark, Buller has figured out the identity of the murderer and how the trick was done, but legally, he has not a leg to stand on and after his adversary kills a third person, after bragging about the crimes in a private conversation, Buller quits the force. Here's a crook in the logic of the book that I can't get over: Buller's motive for giving up his job is obviously hurt pride over his failure to put a homicidal maniac behind bars, but notes that his superiors are also unhappy with him for putting an unsolvable case on the shelves when they had a perfectly good explanation – Beedon shot himself after killing the undergraduate student. But they would've had that case sitting on shelf unsolved because forensics proved it wasn't a murder/suicide and then there's the third murder to consider. It would've required looking into before ending up (officially) as unsolved anyway. Petty nitpicking, I know. After Buller's early retirement from the force, the book takes a rapid departure from the traditional detective story as the former inspector visits his friend Sir Charles Darcy and his sister Elizabeth – with whom he's secretly in love but doesn't dare to dream due to class difference. Ah, that silly interwar period with their Victorian morals. Anyway, Buller explains to them why he left the police and the somewhat eccentric Sir Charles decides to pop-in on the murderer for a challenge which he almost immediately backs away from, but as Buller predicted, they find themselves beleaguered by a madman who can slip in and out of a guarded house and locked rooms unseen! Leaving a prop skeleton or chalking skulls on a mirror before disappearing again like a puff of smoke. This changes not only the pace of the story, but also goes from an intellectual game of Clue to a deadly variation on Where in the World is Carmen Sandiego? confined to a tightly secured mansion under siege. This splitting of a novel in two different parts is recalls Conan Doyle's A Study in Scarlet (1887) and The Valley of Fear (1915), but here the two separate sections form one coherent narrative instead of two separate novelettes and the events/tone of the second portion recalled French mystery writers like Gaston Leroux and Maurice Leblanc. In fact, the situation Buller and the Darcy household finds themselves in reminded me a lot of Rouletabille's predicament in Leroux's Le parfum de la dame en noir (The Perfume of the Lady in Black, 1908), in which a group of people locked up in a fortified castle are fighting off a single man endowed with the same cunning as the killer in Darkness at Pemberley. By the way, the killer in this book struck me as a distorted, villainous mirror image of Sherlock Holmes (e.g. the cocaine habit). All in all, a highly entertaining novel that stitched together Doyle's era of detective stories with those from the author's own time and the great tragedy of Darkness at Pemberley is that it was White's only contribution to the genre. I think Buller in the capacity of an amateur detective, alongside the methods he employed in the second act, would've made him an interesting addition to the genre. Recommended to fans of classic mysteries and old-fashioned thrillers. "Playing as children means playing is the most serious thing in the world." Soji Shimada founded a neo-classical movement in Japanese crime literature, referred to as "Shinhonkaku," with the publication of The Tokyo Zodiac Murders (1981), ensconcing a contemporary thriller within the frames of an orthodox detective story, and the only one of his books that's available in English. Unfortunately, The Tokyo Zodiac Murders continues to this day to be the only one of his mystery novels that made it to the other side of the language barrier, but we can now enjoy a short story, "The Locked House of Pythagoras," in the August, 2013, issue of Ellery Queen's Mystery Magazine. The story was adapted from another translation by John Pugmire, whose Locked Room International enriched many of our shelves with a Gallic taste of the impossible. And now LRI is looking at Japan! "The Locked House of Pythagoras" features the same detective as in The Tokyo Zodiac Murders, Kiyoshi Mitarai, except for one notable difference, it's set during his school days in 1965 – making this story a predecessor, of sorts, to Japanese high school mysteries like Detective Conan and The Kindaichi Case Files. Kiyoshi Mitarai is perhaps seven or eight years old at the time of the story and begins to meddle in a gruesome double homicide: a local and well-known artist, Tomitaro Tsuchida, is slaughtered alongside his mistress, Kyoko Amagi, at his two-story studio/apartment. Every door and window were found to be locked/latched from within and there was one set of footprints encircling the house without entering or leaving the premise. Tsuchida and Amagi were found behind the locked door of the guest room, lying side by side on the floor, which was covered perfectly with papers painted bright red. The police arrested Amagi's legal husband, Keikichi Agami, who confessed to the murder without explaining his miraculous escape from the crime scene – meaning that they still have little to hand over to the prosecutor. It looks impossible enough that they might have to consider taken advise from outsiders. Even if that outsider is a child with the attitude of early period Ellery Queen and tells them they've the wrong guy. 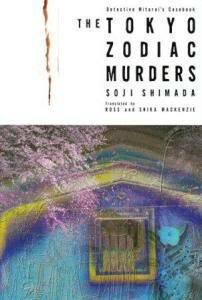 Like in The Tokyo Zodiac Murders, Shimada does not bank on one idea or trick but constructs a multi-dimensional puzzle and that seems to be an approached favored by neo-orthodox mystery writers when tackling the locked room problem. They don't just focus on the doors, locks, windows or fool around with the presumptions of witnesses, but manipulate an entire setting in order to create the illusion. Herbert Resnicow's The Gold Deadline (1984) and The Dead Room (1987) are fine examples of locked room puzzles done on an architectural level, but certain parts also reminded me of Marcia Muller's The Tree of Death (1983) and Paul Doherty's Nightshade (2008). Interesting that these writers, separated by land and language in a pre-(modern)internet era, turned out to have very similar ideas about new ways to lock in on the impossible crime. If there's one thing to nitpick about this story, as a locked room mystery that is, it's the three separate solution that together explain the entire locked house mystery, because two of them I've seen before and the last one was just lazy. But I hasten to add that the strength of "The Locked House of Pythagoras" lies in the overall solution. There's a smattering of clues and Shimada did a wonderful job motivating why a murderer would stage such an elaborate crime. For something that's just fewer than thirty pages, it's a rich story that will surely find its way into future anthologies and if you can suspend your disbelief to accept that a child can solve a double murder case, there's a lot to enjoy here. Note for the curious: there's another childhood story, entitled "The Case of the Lily of the Valley," in which a five-year-old Mitarai solves his first case, but that's all I know about it. "See if you can beat Henry to the right solution," challenges the back cover of Isaac Asimov's Banquets of the Black Widowers (1984), a fourth collection of short stories originally published in Ellery Queen's Mystery Magazine, comprising of twelve of their feasts with puzzles for dessert. The Black Widowers consists of the patent attorney Geoffrey Avalon, chemist James Drake, code-breaking expert Thomas Trumbull, high school teacher Roger Halsted, novelist Emmanuel Rubin and the artist Mario Ganzalo – and the last two amuse themselves by exchanging snappy remarks as if they were running a private detective agency on West 35th Street. Once a month, they gather in a private room at an Italian restaurant, Milano, to relish a sumptuous meal and fine drinks, while discussing a variety of topics and grilling the guest of the month. Alternating between members from month to month, they've to bring along a guest and after dinner, they'll ask him to justify his existence and has to answer every question that is put on the table. Unavoidably, they lay bare a problem or an unexplained episode that's fretting their guest, and as proper hosts, they try to find a remedy, but the correct answer always comes from Henry. Henry is the personal waiter and honorary member of the Black Widowers and perhaps the only "Armchair Detective" who spends an entire story on his feet. Regrettably, the characters and their conversations are often more interesting than the problems they examine, because you've to be a polymath like Henry in order to solve most of them – often hinging on obscure or arcane knowledge. There are a few that you can solve, but the fun in these stories comes from attending their monthly banquets as an unofficial, eight member of the group and sitting in on their discussions. I often sympathize with Geoffrey when he feels that a problem is intruding on the conversation or breaking up the verbal duel between Rubin and Mario. I have the same warm feelings for these characters as I have for Rex Stout's Wolfe, Archie and Fritz. They're just fun stories to read, even if they don't always excel in the plotting department, but lets take them down from the top. Tom Trumbull is the stand-in for the guest in the first story from this collection, because he wants to run a problem through them that involves a feud between two brilliant mathematicians – attached to the government and therefore eager to have it resolved. The problem facing him lies in convincing an eccentric mathematician that his rival, and everyone else for that matter, could've cracked his password with sixty million trillion possible combinations! I buy the explanation of how someone working close enough with him could've eventually stumbled to the password, but not in the way Henry figured it out within an hour. The protagonist from Murder at the ABA (1976), Darius Just, brings a tale from the Hardboiled School to the table and tells the story of the night that he lied to a beautiful woman in a bar about living and breathing baseball – cumulating in an eventful evening in which he saves the girl without ever knowing what was going on. What a great idea to split a plot between two of your detectives, but if you don't know anything about baseball (note that I'm raising my hand here), it's nearly impossible to solve it yourself. In the after word, Asimov wrote that Frederic Dannay rejected this story, not once, but twice and I can understand why, but the premise and discussions, at least, were interesting: an astronomer tells the Widowers about an international conference on SETI and the search for extraterrestrial life where a driver was killed after drunkenly stumbling in front of a car. Conspiracies and spies abound, but the weakness, as usually, is in the solution. The Black Widowers is a club exclusively for men and when Mario brings along a woman as his guest, they begin to bicker and fight, before they can help the lady find the young man who helped her after being mugged during her visit to Manhattan – wanting to repay the money he lend her. Alongside "To the Barest," from The Casebook of the Black Widowers (1980), this is one of the rare stories from this series that I did not like to read at all. Hostility among the Widowers strikes a false note, here about a woman and in the other an inheritance from a member we've never heard about before, and their solutions didn't made up for any of it. 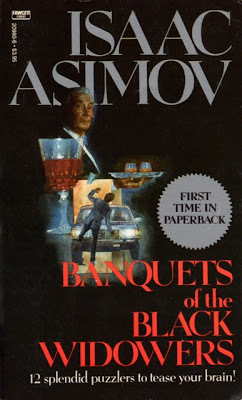 Note for the curious: in the after word, Asimov explained that he played around with variations on the rigid format of the series and listed some possibilities: "I have sometimes thought about getting them out on a picnic in Central Park or having them attend a large convention en masse, or separating them and having each do a bit of detective work with Henry pulling the strings together at last (I may try that last bit if I ever do a Black Widower novel, which somehow is not a thought that greatly attracts me)." If that humanoid-looking, fiction producing machine had been given ten more years to operate, that novel had been a fact! Their guest of this month, Mr. Herb Graff, wants to make a screen adaptation of Gilbert and Sullivan's The Pirates of Penzance, but before they can go into production an argument has to be settled, in which year did it take place – in 1873 or 1877? Henry compares the text from the operetta with history to answer Mr. Graff's question. Not bad, but only solvable if you know your history and your G&S. This was for me a new and now one of my favorite Black Widower stories, in which John Smith has a strange adventure in an Eastern European country, tugged away behind the Iron Curtain, when he has trouble identifying himself to a policeman after being mugged – who nonetheless believes him and lets him go. How did the policeman know he was telling the truth and was not a spy? The fairly clued and clever solution made this, for me, a standout in the series. A story full of skullduggery, looters and shady business connections in the world of museums caught in the meshes of international trafficking of ancient artifacts – like a cup of gold and enamel from 1200 B.C. The most interesting aspect of this story is that the Widowers help a curator in retrieving an item that was smuggled out of the Cyprus and purchased on the black market. A rather weak and trivial story, in which the Black Widowers probe their guest to find a problem that he did not qualify as such and possibly mended broken relationship in the process. As unsolvable as most of them, but definitely a lot of fun to read and wholeheartedly agree with Asimov's sentiment in his after word about doing these crackpots in the eye – even if they are fictional ones. Their guest has a sister who's dying from cancer and under the influence of the Cosmic Order of Theognostics, who expel the presence of malevolent aliens with prayer and incantations. How that would stop any being capable of crossing the stars is a mystery Asimov never acknowledged. Anyway, he doesn't care about the money she's leaving them in her will, well supplied with that himself, but he wants to prevent them from gaining their ancestral home and has been posing as a convert to regain possession of the house after she passes away. But to convince her to put him in her will, he has to experience enlightenment that tells them where the aliens originated from and she gave him some vague clues. The story also includes discussions and links with the works of Edgar Allan Poe, Conan Doyle and other (early) mystery writers, and a good false solution that will probably be everyone's first guess. From all the Black Widower stories I have read, this one has always been my favorite ever since reading it in The Return of the Black Widowers (2003), a compilation and tribute volume, and best of all, it's a genuine locked room mystery. A guest is unsettled by his redheaded wife claiming to be a witch and after an argument in a lobby walks into a restaurant with one-way in-and out and promptly vanishes into thin air. The solution is simple, but absolutely believable and original, and the idea was came to Asimov in a dream – premise and conclusion all wrapped after a refreshing sleep. An interesting premise, a man who lives in one of a group of houses known as the Four Sisters, which all look identical on the outside, stumbles into the wrong house one night to find a group of counterfeiters. Asimov plays scrupulous fair in this story and, ironically, that's what did this story in, because they shouldn't have needed Henry to solve this one. Just when they were having banquet without a puzzle to untwined, a man storms into the room who has heard of their reputations and wants them to help find the man who took advantage of his mentally sister. They understand that helping the man will have repercussions, however, Henry has some wise, if cruel, advice for what to do with the man. Not a very pleasant of good story to round to this collection out with. All in all, I enjoyed reacquainting myself again with the Black Widowers, even if you can't ways read that back in this review, but that's because I try to judge them here on their merits as a detective stories, however, this is one of he few series that I really read just for the characters. Like I said at beginning of this review, I love their interactions and following their discussions with a good plot just being an added bonus. I picked the post-title for this review from the chapter Agatha Christie contributed to The Floating Admiral (1931), a round-robin novel she did with members of The Detection Club, which seemed really appropriate to use since Asimov was also a big Christie-fan. "It is desirable that you should earn your fees, but it is essential that you feel you have earned them, and that depends partly on your ego." Off the bat, I have to confess that I've never watched a single episode of the 50s private-eye flick 77 Sunset Strip, starring Efrem Zimbalist Jr. as Stuart "Stu" Bailey, a character that originated in the work of the series creator, Roy Huggins, from the late 1940s – resulting in a tie-in novel with stories predating the television series. 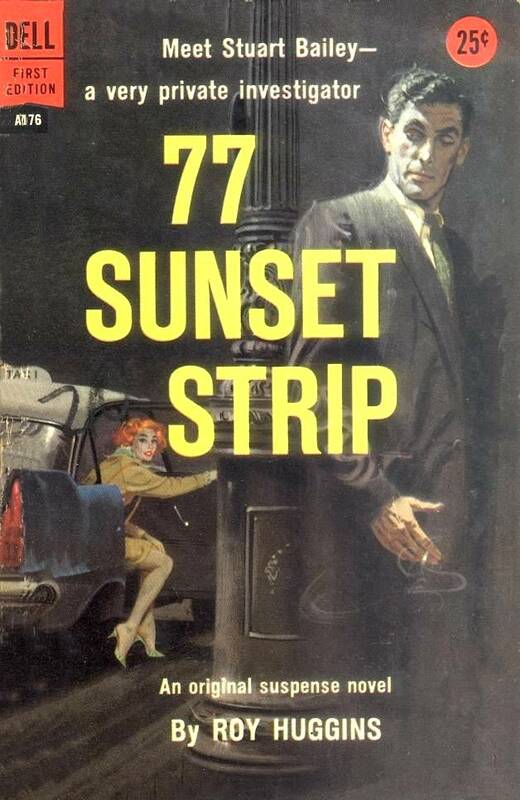 77 Sunset Strip (1959) is a compilation of three short stories, "Appointment with Fear" and "Now You See It," published in The Saturday Evening Post, and "Death and the Skylark" from Esquire, fastened together with bridging material. And they're all listed in Robert Adey's Locked Room Murders and Other Impossible Crimes (1991)! But what really slingshotted Huggin's 77 Sunset Strip to the top of my wish list is the comparison in make-up the book has with one of my favorite Bill Pronzini's novels, Scattershot (1981), in which three short impossible crime stories were strung together into a coherent narrative. Add that all up and you'll understand why I had to give in to temptation. Stuart Bailey's first client is a wealthy one, Glen Callister, harboring suspicious that his wife, Eilene, or the first mate of his schooner the Skylark, Owen Madden, wants to do away with him during their trip to Honolulu and Bailey to accompany them – under the guise of an old business associate. The retainer is five hundred dollars. Aboard the schooner Bailey has to deal with the advances of Eilene, Madden dropping him after stumbling in on him making out with Eilene and Betty Callister who's excited at the prospect at having a bachelor like Bailey attending her father's yacht party. All this tension accumulates with the prophesized murder of Glen Callister and as they're three days removed from Honolulu in a simmering climate, they’re forced to bury Callister at sea – destroying important evidence. Their actions and almost uniform statements put them in jail for more than a week before Bailey returns to the schooner to reconstruct the murder. I personally would not qualify this as a locked room or impossible crime story, but the method could've definitely been used to create one. This is more a story about a crime, and its effect, than about solving it. Back in the office, Bailey finds a telegram pleading to meet D.C. Halloran at the Desert Inn, Tucson, Arizona, with a money-order draft for seven hundred dollars attached to it. Halloran turns out to be a frightened woman on the run for "They" and Bailey returns to her dingy, one-room apartment to crash on the couch as a guard dog. There's a wall bed that, when unfolded, reached across the room all the way to the door and nobody, even if you have a key, can enter or leave the apartment when the wall bed is down. Well, you guessed it. When Bailey wakes up the next morning he finds his client sprawled on the floor, strangled, and everything was securely locked from within and the bed was still down! Bailey becomes, not unexpectedly, a suspect on the run after assaulting a police officer and has to find out what happened the night before they catch him again. Oh, and the body also disappears from the locked apartment. Just to make things a little bit more complicated. The only disappointing part from this portion of the book were all the possibly solutions that shot through my head that went unused. You also have to wonder if Fredric Brown was aware of this story, because the premise of Death Has Many Doors (1951) is very similar. Maybe Brown thought (correctly) that he could improve upon it. Finally, a phone call summons Bailey to a home in Westwood, where a denial and a sudden exchange of money pulls him in the middle of a murder case. Bailey is introduced as a Mr. Tate to the household and when tea is served the room is plunged into darkness, and when the lights come on, he has yet again lost a client – stabbed with a knife that dissolved into thin air. There were six people in the room, place all shut up, and during a brief moment of darkness a man was stabbed and nobody left the room until the police arrived. But the weapon did not turn up in any of their searches. The search for an apparent unfindable object is usually associated with Ellery Queen, but I would place Huggings, as a hardboiled writer, alongside Arthur Porges because two of the three locked rooms were firmly grounded in the scientific school – and the problem and solution of the vanishing knife is something straight of a Cyriack Skinner Grey's casebook. This was also the most original one of the three, because Huggings gave for the first two his own particular spin or twist to a well-known trick in the book. Very well done though. 77 Sunset Strip is a fast-paced montage of three cases pitting a street-wise, smart mouthed private detective not just against the dangers that come with the job, but chucking a few brain teasers at him as he's running from situation to situation. Stuart Bailey also appeared in The Double Take (1946) and another short story, "Aunt Willie's Ghost," listed in Adey. "Thieves find entrances, but grifters... we make them." Keith R.A. DeCandido's The Zoo Job (2013) is the second tie-in novel to the Leverage TV-show, a resumption of the series in book form after TNT pulled the plug after its fifth season, and continuity is the (unofficial) theme of the story. The Zoo Job takes place during the fourth season of the television series, somewhere between The Queen's Gambit Job and The Radio Job, and centers on Brillinger Zoo that has been in the hands of the same family since the 1800s, but the place is off the tourist track and falling on hard times. Marney Billinger wants to shake up business with the exhibit of two black rhinos, which she managed to secure through a Malani priest, but the animals never arrive and are now obliged to pay hundreds of thousands of dollars to the priest – who needs the money to run a struggling medical clinic in a poor country under a dictatorial regime. One of Brillinger Zoo's younger, but regular, attendees, Zoë Kerrigan, who appeared in The Beantown Bailout Job, nudges her in the direction of the men who helped save the lives of her father and herself, Nathan Ford ("The Mastermind") and his crew. The only problem is that they're not exactly sure who their mark is. So they do what Fred would've done, if this had been a Scooby Doo episode, and split up the gang. While Parker ("The Thief") and Alec Hardison ("The Hacker") bore themselves with surveillance work of the zoo's board members, Sophie Devereaux ("The Grifter") and Elliot Spencer ("The Hitter") infiltrate the Malani clinic. Malani was a former Portuguese colony and an independent West African kingdom, under King Lionel's rule, until he was over thrown by General Polonia – and third season ties with his corrupt minister of finance sort of makes this book an aftermath of the Damien Moreau-arc. DeCandido covers nearly every major event from the show, ties-in background stories and name dropped pretty much all of the side characters, which sometimes made the story feel like a companion guide to the TV-series. But is a respect-and artful treatment of the source material really a draw back in a tie-in novel? Not for me, but if you're unfamiliar with the original incarnation of Leverage, you might want to sit through a few episodes before digging into this book. But one thing's for sure, The Zoo Job has more continuity than Burke's Peerage. If there was one drawback, it was the lack of a clear and proper villain for the crew to target, and as a result, we were deprived of a long con full of fun, but dangerous, pitfalls – which were represented here by Interpol's James Sterling ("The Antagonist") and Malani's finance minister, Aloysius Mbenga, with his armed goons. They've to figure out whom to zoom in on and what the game of their opponent is, before they can put a stop it. And that full picture doesn't emerge until quite late into the book. Leverage was known for trying different approaches of telling the story, but there was always a mark or goal (e.g. beating an unbeatable security system) and it felt a little bit like watching Columbo stumbling around without knowing himself who he's suppose to be hounding. But that's a minor, fan boyish complaint on an excellent job at translating the characters and atmosphere of the show to paper and weaving a good story around it. I hope these novels do well enough that they commission more of them and perhaps open a new avenue to re-launch the TV series. Here's hoping! My review of Matt Forbeck's The Con Job (2012). Note of interest for this blog: one of the characters was reading Rex Stout's Murder by the Book (1951). "Everybody was wrong... The judge was wrong. The jury were wrong. The prosecution was wrong. The defense was wrong." Before taking a stab at reviewing an impossible crime novel from the heyday of the detective story, I want to direct your attention to a post I compiled last year, "My Favorite Locked Room Mysteries I: The Novels," which I updated a few days ago. I've added and replaced numerous titles that made list bulkier than it was before. So if you’re looking for suggestions for your TBR-pile, you might want to take a peek at the new list. 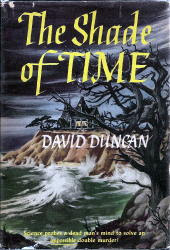 David Duncan's The Shade of Time (1946) was favorably commented upon by Robert Adey in Locked Room Murders and Other Impossible Crimes (1991), "more than just an excellent essay on the locked-room theme" and "first-rate detective novel from a writer better known in the science-fiction field," and I agree, if you single out the impossible material in the book – which is there in abundance. But in my opinion, I think Adey over praised Duncan's overall contribution to the locked room sub-genre. However, that's not to say that The Shade of Time is not without merit and personally liked the theme of the past rising up to obscure the present. The premise and opening shares some similarities to the last mystery I reviewed on here, The Case of the Drowning Duck (1942) by Erle Stanley Gardner, in which a murder that was shelved as solved with the conviction of the murderer is reinvestigated – except that the wrongfully accused man in this story lived to conduct his own investigation upon his release from prison. Sebastian Sand was convicted for murdering John Harth, a promising physicist laboring on the atomic displacement theory, with an arrow to the chest in his sun-porch converted laboratory on the strength that Sand was the only other person in Harth House at the time of the murder – arguing that the arrow could not have been loosened from the outside because there were no broken windowpanes. A windowpane next to the door had to be smashed to unlatch the door, but it's a spring-lock (of sorts) that snaps into position after you close the door behind you and everyone else was accounted for at the time of the murder outside of the house. The influential Harth family also did their part in helping Sand to be convicted in order to keep him away from John's sister Constance. A decade later Sand is pardoned and conspires with two of his friends, Ray and Alice Kingsley, in arranging a reunion party at Harth House to find the person responsible for the murder of John Harth by playing mind games and staging a reconstruction of the crime – in an attempt to prove the displacement theory that would allow an arrow to pass through a pane of glass without shattering it. Unsurprisingly, something goes horribly wrong when Sand fires an arrow at the supposedly empty and somewhat overgrown laboratory, as dim and ghost figure looms up in the window, taking the projectile full in the chest! The theory of atomic displacement and how it was entertained for a while was a nice a substitute for ghosts and curses that commonly haunt these tales. What looks at first glance as a foolish, but genuine, accident slowly, but surely, begins to look more and more impossible as the official investigators gather more facts and what happened to create this second locked room killing is more worthy of that label than the first one – which was more a question of alibis than trickery. Even if the overall effect of this second locked room is a patchwork of ideas most readers are bound to recognize. Still, I can understand Adey's praise because the most fun part of the book was the discussions of the seemingly impossible elements in the case including a bunch of false solutions. By the way, the official investigators I referred to are Jim Quigley, a highly educated chief of police, and a Dr. Cook, who are introduced in the opening chapters of the book discussing the Harth case and meet a few more times before they officially become involved in the second shooting incident and Quigley handed me the idea of quoting Dr. Gideon Fell for this post. I'm sure that Duncan was familiar with John Dickson Carr, and other mystery writers who dabbled in the miraculous, and Quigley seems to have been attempt at a cast-off of the Great Detectives and he has his own ideas on crime, like a disease it should be prevented instead of solved, but does nothing himself but sit around waiting for something to happen at Harth House. Why test your theory when an opportunity presents itself and safe a life in process? Anyway, in the second chapter Quigley said, "if it was a classic case, it was classic in the sense that the police couldn't possibly go wrong,” appending, “and in spite of it all, the police possibly did go wrong,” which is something that would've no doubt infuriated someone if Dr. Fell or H.M. had uttered it. And it reminded me of that quote from that radio play that now only exist in it entirely as a typescript. But Duncan was far from the writer that Carr was, and while the locked room elements and discussions were good reading, the writing and characters were not and closer to Anthony Wynne – another locked room specialist scuttled for his embarrassing and unrealistic melodrama and often bad writing but still had some good plots. I'll probably get some flack for bringing up Paul Halter, an impossible crime from the past parroted in the present is a hallmark of his fiction and his characters have a tendency to feel out of their time, but for all his faults, Halter is leagues better as a mystery writer than Duncan was. Now that I think of it, I wonder what Halter would've done with this plot since Quigley and Dr. Cook could easily be swapped for Owen Burns and Archilles Stock. To sum this lengthy, rambling review up is that David Duncan's The Shade of Time has points of interest as a locked room/detective problem, even if bits and pieces of the plot became muddled and confusing towards the end, but otherwise, it falls short of the mark and the interesting points aren't strong or original enough to make it eligible for my list of favorite impossible mysteries. Hm, a very uneven conclusion to a very uneven story. "When you once get the correct master pattern, every single event fits into that pattern. It dovetails with every other event which impinges upon it. When you get a master pattern which seems to accommodate all of the events except one, and you can't make that event fit in, it's pretty apt to mean that your master pattern is wrong." The infamous courtroom conjurer, Perry Mason, has an admitted lack of interest in routine cases, but suspects that the problem that's bugging John L. Witherspoon has some points of interest – revolving around a murder presumed to have been solved and the murderer was hanged by the neck twenty years previously. And that's the premise of Erle Stanley Gardner's The Case of the Drowning Duck (1942). John Witherspoon is a wealthy patrician who prefers that the ancestry of his future son-in-law can be traced back to the passengers aboard the Mayflower, which becomes a problem when Marvin Adams, the love interest of his daughter Lois, turns out to the be son of a convicted murderer. Marvin's mother always kept this a secret and Witherspoon wants Mason to pore over the transcript of the trial to see if there's any room for rehabilitation, if not, he's adamant to break up the engagement. Even if he has to put Marvin in a position that brings his inherit, homicidal tendencies to the surface. As to be expected from a Perry Mason novel, the plot buzzes with activity and quivers along multiple lines, which includes an extortion racket, a Hollywood scandal sheet and a shady private investigation firm – alongside the imagery of a drowning duck. There's no mystery how a duck can loose the ability to float on the water in this book, it's a new chemical known as a detergent, that affects the oily substance that helps them water proofing their feathers. Marvin is a keen young man interested in chemistry and psychics, who performed the experiment with the detergent and a duckling. And that forced Mason to adjust the evidence when stumbling upon a present-day crime scene. Leslie L. Milter was one of the private detectives who worked for the firm Witherspoon hired to dig around in Adams' past, but when Mason and Officer Haggerty entered Milter's apartment they find his body sprawled on the kitchen floor – dead after apparently inhaling a whiff of deadly gas. But even more noteworthy is the aquarium, in which a duck was so far submerged that only part of its head and beak was sticking out of the surface while struggling not to drown. A huge chunk of the fun in these stories is derived from Perry Mason manipulating and scheming his way through a murder case, from altering evidence at the scene to bending witnesses to his hand, which is arguably even more fun to read than his court room shenanigans. At least, I think so, because every action Mason undertakes usually has an opposite reaction, giving you the idea of a mental chess game. Perry Mason’s job is not just to provide an answer at the end of a story, but to move the entire plot to that destination. If that makes any sense. There's a second murder that follows a pattern that has been rather prevalent on this blog: accidently finding (minor/borderline) locked room mysteries that were never recognized as impossible crimes. A second man is poisoned with gas in a room that was not locked, but the personal situation of the victim ruled out suicide and the trained police dogs patrolling the ground eliminated any outsiders – leaving John Witherspoon as the sole suspect and soon finds himself in the same circumstances as Marvin's father all those years ago. Unfortunately, the solution to this second murder was under whelming to a locked room enthusiast like myself, however, it was only a cog in the wheel of a bigger story that, if not the best Mason novel I have read to date, was still a good read. Plot-wise, it was in search for a better second-half, but overall, not a bad read.